Thieves have used a forklift truck to pull a cash machine from the wall of a convenience store. A Glasgow man who died after a crash involving an articulated lorry has been named by police. Robert Sharp, 50, from Maryhill, died in hospital following the incident in Dumfries and Galloway. An articulated lorry loaded with fruit and vegetables crashed off the A75 Gretna to Stranraer Euro-route, east of Dumfries early this morning. A man has been hospitalised following a serious crash on the A75 in Dumfries and Galloway. The three vehicle collision, which involved two lorries and a car, took place at Cuckoo Bridge Roundabout, near Dumfries. Police are appealing for witnesses after a ‘road rage’ attack near Castle Douglas. 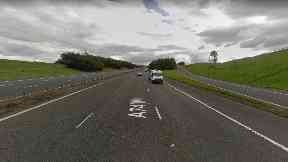 It happened at around 11:15pm on Wednesday 14 December, on the A75 near the Ramhill, Castle Douglas. Police say a 48-year-old man driving a Mercedes Sprinter van was overtaken by an articulated lorry, which pulled up sharply in front of him. The driver of the lorry then left the vehicle, and assaulted the van driver. The van driver, who is from Birmingham, was left with a sore face and in a shocked condition, and the lorry driver left the scene after the attack. The only description that the victim was able to give regarding his attacker is that he was between 40/50 years old, stocky build with a beer belly. He was about 5’8″ tall and had short grey hair and a goatee beard and moustache. He was wearing a red and white vertical striped t-shirt, jeans and safety boots. The victim received some cuts to his face as a result however did not require medical attention. We want to hear form anyone who may have been on the A75 near the Ramhill around this time to get in touch if they saw anything which might help us in this investigation. The victim was unable to indicate why this assault might have happened.